The City of Semmes is “stronger” and “more transparent” than it was a year ago before its leadership changed hands. So much has been accomplished over the last twelve months, I am hard pressed to summarize all of the progress that has been made, but I will try. First, and foremost it has been the mission of the City Council Members and myself to restore faith in our City Government and to ensure we are “accountable for operating in a fiscally prudent manner.” In order to achieve this, we had to change the way things have traditionally been done in this City. We did not want to repeat the mistakes of the past. To that end, we have made immense progress, but we will continue to strive in the future to improve operations of all of our city departments to better serve our community and the citizens of Semmes. Currently, the City of Semmes is on firm financial footing with consistently strong tax revenue for the 2016-17 year. Retail sales tax remains our primary source of revenue. The City of Semmes is debt free, and there are funds in reserve for future capital projects. There is over $6,000,000 in the bank, even after the purchase of the fire-fighting equipment and truck for the establishment of the City of Semmes Municipal Fire Department earlier in the year. These funds will allow us to continue to grow the city, and attract new businesses to the area, which will benefit the citizens of Semmes for many years to come. I want to applaud the City Council for its unanimous approval of the 2018 budget and the City’s tireless employees for their thoughtful work on it. The budget is an investment in the improvement of our community with a goal of maintaining an exceptional level of service for our residents. When it comes to budgets, we will be smart and transparent with your money, continuing to save money when possible while adding to the City’s savings accounts every year in order to ensure that the level of professional services to our City are sustainable year after year. Last year in November 2016 when the new administration assumed leadership of the City, two of the three fire stations located in Semmes were locked down by the previous Mayor and the Volunteer Fire Board. Through the perseverance of a private citizen, Mickey Dearmon, the dedication of a group of previous Semmes volunteer firefighters and the new Semmes Fire and Rescue, the City of Semmes and all outlying areas were provided with fire protection while ownership of the fire stations were decided in court. Because of this collaborative effort between private citizens, the new Semmes Fire and Rescue Municipal Fire Department, and the City of Semmes administration, all three fire stations were returned to the City of Semmes and its citizens. They are now open, operating, and fully staffed with professional certified firefighters and state of the art equipment to include a new fire engine. The Public Safety Training Center is fully functional and engaged in training both local and Mobile County firefighters from other jurisdictions. Even with all the challenges presented with the dissolution of the Semmes Volunteer Fire Department at the beginning of 2017, and the establishment of a new municipal fire department, Semmes Fire and Rescue was able to maintain an ISO rating of 5 for the Semmes area. This ISO rating of 5 translates into lower residential and commercial insurance rates for all the citizens of Semmes. This low ISO rating can be credited to the hard work of our Semmes firefighters and the leadership of our Fire Chief Kevin Brooks. 24 hours a day, seven days a week, police response times should improve. Roadway Lighting-The City entered into an agreement with Alabama Power to install LED street lighting throughout Semmes along dark roadways identified by Semmes Public Works and private citizens. Phase I has been completed with LED lighting installed at 19 locations. Phase II installations are underway and Phase III is planned with the input of private citizens. Approximately, fifty (50) LED lights have been installed on the streets of Semmes in 2017. This additional lighting will increase driving visibility at night and serve to deter crime at these locations within the City. Street Paving-Multiple streets throughout Semmes have been paved this year. The on-going paving of streets within the City will continue as Public Works executes the infrastructure maintenance goals set forth by your City Council and Mayor. Over three (3) miles of city streets have been paved in the City of Semmes during 2017. Parks and Recreation- In addition to the on-going paving and lighting projects, the City of Semmes Public Works/Parks maintains all City parks to include Honor Park, Camellia Park, and the City of Semmes Municipal Park. Also, a total of thirty (30) miles of roadway right of ways within the City are mowed and maintained by the Public Works department each month. In June of 2017, LendEDU named Semmes as one of “The Best 100 towns in the State of Alabama for Starting a New Business.” In total, nearly 500 Alabama towns and cities were evaluated over the course of this study. New/Renewed Businesses in the City of Semmes in 2017 Approximately, 140 businesses moved or renewed business licenses in the City of Semmes in 2017. New businesses that have moved to Semmes this year include realtors, retail, and restaurants. We welcome all of these new businesses to our city and we look forward to growing and prospering together. In February 2018, Semmes will welcome the “Popeyes” franchise to our City. New businesses also opening in Semmes in 2018 will include Dollar General, Merchants Bank, and Mitchell Ellis Products. As your mayor, I will continue to work to seek out new small businesses to move to Semmes. Currently, I am trying to secure a “steakhouse’ for Semmes as many residents have expressed that they would like to have our dining experiences expanded within our community. The City of Semmes close proximity to Mobile and our strong residential growth is a favorable climate for new development for both restaurants and small businesses alike. At the very top of my “to do” list this year was the subject of City government transparency regarding the financial dealings of the City. During the campaign in 2016, residents approached me many times with their concerns, requesting that as the “new” city we become more transparent than the previous leadership. 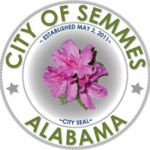 In early September, the official City of Semmes government website was launched at www.cityofsemmesal.gov . On this website, all citizens can access financial reports and budgets, as well as council, advisory committee, and planning commission meeting minutes. Residents can request city services, access general information, and view City government and community information. Any and all information regarding the business of the City of Semmes is available via this website. I promised during the campaign that we would become more transparent and we have via the launching of this website. There are many people to thank for the collaborative successes this year within our community. The successes experienced over the last year would not have been possible without the dedication and work of the City Council, our Advisory Committees comprised of resident volunteers, our City Department Heads and our city employees. I consider our City to be blessed with a highly competent, seasoned, and professional City Council. These Council members spend untold hours talking and listening to Semmes residents. They are diligent and dedicated to being the voice of our community. The Semmes City Council has been supported by recommendations from our Advisory Committees which are comprised of citizens who have volunteered their time selflessly this year to listen and provide suggestions on issues brought before them for review. We sincerely appreciate the counsel they have provided to us on the challenges we have faced as a City. The human element of City services is sometimes overlooked, but behind the human resource budget line item are people. These people and their Supervisors deliver the City services promised and they remain committed to the idea of public service to their community. They are capable staff members that acknowledge that their job is to serve the residents of Semmes to the best of their abilities. We could not provide the professional level of services to our residents and our community without them. Talking about a City’s vision is big. Without a vision, a City does not move forward. Communities can either get better or get worse, but they cannot stay the same. Being rooted with a strong, clear vision is what has always allowed our country to work through difficult times and the same can be said for the Semmes community. Working on the day-to-day operations keeps the City of Semmes running smoothly and that is always important. However, when we ask each other what will keep our children here in 30 years, that’s a forward thinking question. We want to make sure that we are building and creating a city that people will want to call home now and for many years to come. With that vision in mind, I am pleased to announce that beginning in January 2018, the City of Semmes Branch of Bishop State Community College will begin to hold classes at the City of Semmes Public Safety Training Center on Illinois street. Bishop State will offer four college credit classes, four nights a week at the Training Center. Each credit earned is transferrable to any State of Alabama College such as the University of South Alabama, the University of Alabama, or Auburn University. To sum it up, children and citizens in the Semmes area can have full-time college student status and never have to leave Semmes to accomplish that. The financial savings for aspiring students seeking higher educational opportunities, shortened commute times, and the availability of course offerings are just some of the many advantages that forming a community partnership such as this one will afford to our citizens. Other topics under consideration and discussion in 2018 will include: The establishment of a permanent City Hall building within the community, the addition of a fourth (4th) fire station, and continuing annexations within the core of the current City of Semmes jurisdiction. As we continue to debate budgets and issues that arise within our community, let us focus on building our children’s future in our community today. In the coming year we need to look at every new policy, every new initiative, every challenge, and every opportunity with an eye to the future. We need to focus on building our children’s future today in our community and let us continue to strengthen, build, and move our community with a spirit of generosity and with a mission that is larger than ourselves. Staying focused on our future and that of our children in our community is essential to keeping us from being stuck in petty differences, “pet projects”, annoying anxieties, and spiteful conspiracies. After all, what we can do to make Semmes better for our children and grandchildren is what we can do to make Semmes better for everyone. The City of Semmes is a strong and resilient community with a heritage of caring for our neighbors and friends with foresight and compassion. We want to keep it that way. Thank you all so much…. At the end of each fiscal budget year, in November, the City of Semmes Mayor will provide a summarization of the challenges that faced the City of Semmes and it’s municipal government during the past year, current conditions, and future plans for the City of Semmes. The State of the City Address will cover these topics and much more.